The heavy single KB swing, or double KB swing is tremendous for Glute and Hamstring strengthening. This is very good especially for wide stance squatters and sumo pullers too. For narrower squatters I like heavy one arm snatches in the squat stance. For Powerlifters with less flexible shoulders or wrists or arms too big for front squats, the double KB front squat is fantastic. Some might say even with double 106s it could never be heavy enough. When I can handle double 106s for reps I will let you know. For me 495×3 in the squat raw is easier than double 88s for 8-10. Not sure why, but like I said different is good and what helps make the biggest changes in your lifts. Powerlifting moves are used in all Brighton Kettlebell classes, so come down to check them out! 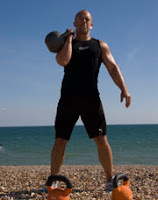 If you’d like to go heavy, Brighton Kettlebells has 32kg kettlebells! Due to the sucess of the Thursday classes, Brighton Kettlebells are proud to announce the launch of Tuesday evening classes. This will be held at the slightly later time of 7:30pm for those that need a little extra time to get there after work. We’re also going to trial a Saturday class, which will be held at 1pm this Saturday 22nd August. If this is a success, it will become a regular fixture. BRIGHTON KETTLEBELLS MEETS CROSSFIT LONDON! I took my good friend Kelvin Gardener (Cheetahs Gym/ Strength-Tec Gym) along to meet Andrew Stemler of Crossfit London fame, for the Crossfit London Kettlebell Seminar, in Beckton, London. Held on the 16th July, 2008 at the East London Gymnastics club, the seminar showed us how to safely do the fundamental kettlebell moves including of my faves, the Turkish Get-up. As well as witnessing Andrew’s comical style, it was great to see a different perspective on the exercises and their execution. I’d always heard Crossfit had some controversial ways of doing things, which is why Kelvin and I decided to check this workshop out! Brighton Kettlebells is always open to new ideas and accepts there are many ways of doing the tried and tested. Most notable was the increased range of motion used in the Kettlebell swing. At Brighton Kettlebells we take the kettlebebell swing up to around chest level, using primarily the hips, letting it float momentarily before letting gravity take it down between the legs. Not in Crossfit! Crossfit enforces a Kettlebell swing which is not for the faint hearted, it rises way above the head, taken to an almost overhead position, before letting gravity do it’s thing. This is typical of Crossfit, grab a difficult move, and make it harder, to maximise pain, increase aerobic output and calorific expenditure! Needless to say, Brighton Kettlebell classes should see some of these variations peppered in to workouts to keep people on their toes….just when they thought it was all getting easy…….. The Accelerated Learning Workshop on Brighton Beach is still available at the discounted price of £65. Kettlebells are getting some publicity! It seems the public are getting very interested in these great training tools. one80news has just published an aricle about Brighton Kettlebells. Scroll down to page 20. When: EVERY THURSDAY FROM 3RD JULY, 2008. (On the green by the King Alfred Car Park). Note: Meet up in front of Cheetahs Gym for class registration. also have the option of paying per session at £8.